The Atassi Foundation’s latest exhibition, Personal Revolutions, celebrates the life and work of women artists from Syria across different generations. The show, curated by founder Mouna Atassi, looks at the journeys of these artists in the context of their personal development as well as the wider backdrop of the intense social and political changes in Syria from the early 20th century to the present day. In addition to artworks by various artists, the show also includes a collection of photographs, exhibition catalogues and published articles that offer insights into the role played by women artists in the evolution of Syrian society and art. It is accompanied by a well-researched catalogue that traces the history of women in the Syrian art scene. “To understand a society, one must look into the role and dynamism of women. There has never been a dedicated exploration of the art scene relating to women artists in Syria, and our aim is to fill this void, even if what we have brought together here just scratches the surface. I have worked closely with many of these artists and I have seen how they have struggled to prove themselves despite social obstacles and fought personal revolutions to assert their presence in society and in the art scene. Working with various media, these trailblazing women allow us to see through their eyes, as they parse through the most pressing issues of their time, ranging from traditional subjects of home and family to explorations of identity, political strife, the female body and taboo, displacement and personal growth,” Atassi says. The oldest works in the show include an antique handmade Damascene brocade bridal broderie and a tapestry produced in 1931 by women at the Al Sanaye Womens’ School in Alepppo. The exquisite works remind visitors that Syrian women have always been involved with art, but it was considered decorative ‘feminine art’. 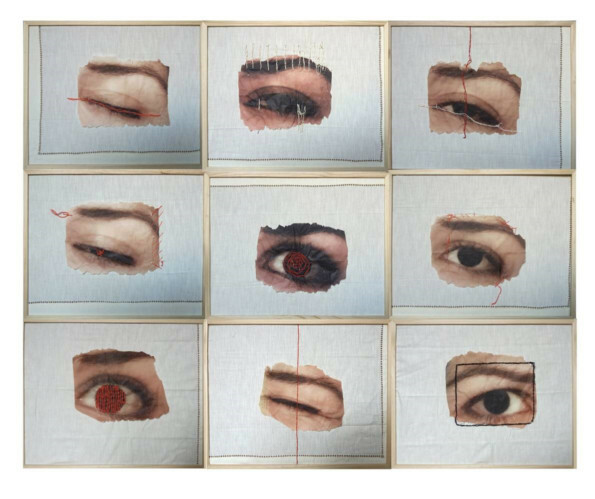 The most recent work in the show is also a work on textile by Sulafa Hijazi. 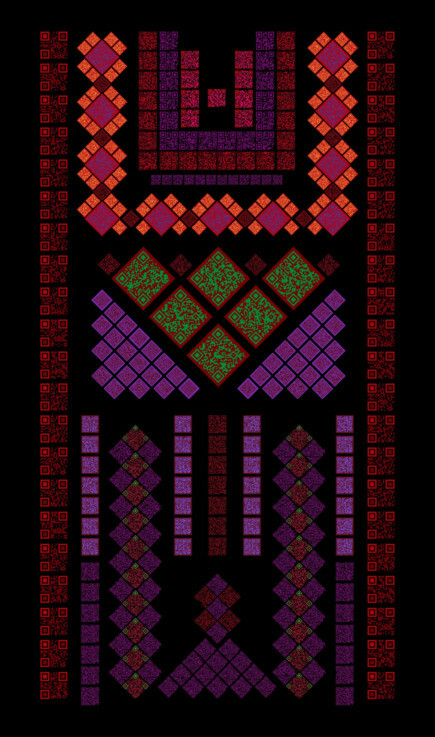 The digital work looks like a traditional hand embroidered Syrian dress, but the motifs are composed of working QR codes. When scanned, the codes take visitors to different links about the historical, cultural, political and social significance of Levantine embroidery and the stories of the women who collectively create it. Within this time span, the show tells the story of women artists in Syria through works by artists of three different generations. It begins with artists who participated in exhibitions during the 1950s and 1960s. Due to their obligations to their home and family, these women could not pursue art as a full-time career, and in the absence of opportunities for formal art education in Syria, they trained with well-known male artists, studied art abroad or were self-taught. Their artworks in the show indicate that they mostly worked with traditional media such as painting and sculpture and their subjects generally included portraits, landscapes and themes such as motherhood. Artists from this generation featured in the show include Dorrieh Fakhoury Hammad (wife of artist Mahmoud Hammad) and Hala Al Kouatly, who both studied art in Rome; Iqbal Karelsy a self-taught artist, who was the first woman to have a solo exhibition in Damascus in 1965; abstract artist Asma Fayyoumi; Leila Nseir, who is considered a revolutionary of her time; Shalabiya Ibrahim, known for her watercolours inspired by myths and folk tales and filled with feminine figures; and Loujaina Al Assil who focused on illustrations for children’s books. Photographs of the artists, a selection of publications by the Syrian Ministry of Culture featuring the artists and their work on the covers, and newspaper articles about their shows, including a story about Kouatly’s solo exhibition in Dubai in 1996 offer good insights about their contribution to the art scene of that time. There are also articles about the role of women in art merely as models for paintings. 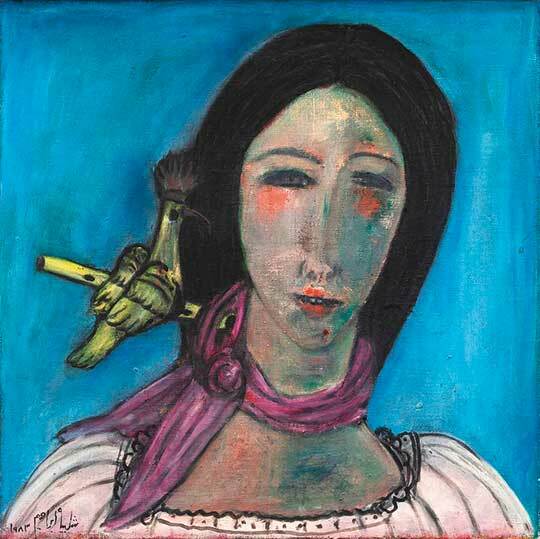 One article gives details of a competition held in 1961 for selecting the most inspiring muse for Syrian artists. It has photographs of a line-up of women contestants being appraised by a panel of well-known male artists such as Louay Kayyali and Mahmoud Hammad, and stories about the beauty of the winner, and the popularity of an exhibition of portraits of the three finalists painted by artists from across the country. However, it is worth noting that the panel of judges included Dorrieh Hammad, and that portraits of the winners by Kouatly and Karelsy were among those presented in the exhibition. The younger artists are women who revolted culturally, artistically, socially and politically to pursue their artistic careers and to experiment with new media and themes, making their voice heard on gender, identity, politics and other contemporary issues. For example, Laila Muraywid boldly uses the female body in her photographic works to comment on the taboos, restrictions, norms of beauty and decency, and double standards imposed on women. And, Nour Asalia has used techniques of mummification that her father used for preserving animals he hunted, to create thought-provoking sculptures. Iman Hasbani has delved into her childhood memories to create a photomontage installation that explores the separation between mind and body, dreams and reality. Whereas, Randa Maddah’s video shot from the roof top of her house in Majdal Shams located on the ceasefire line in the Golan Heights speaks about the separation of people from their homes and families. 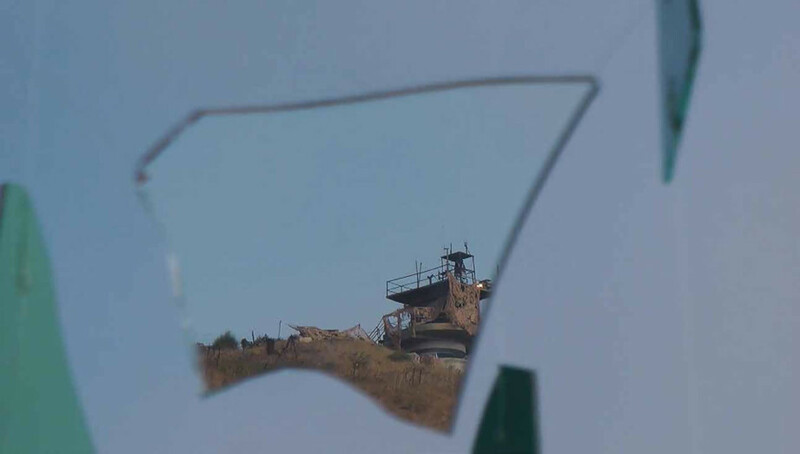 Through a complex construction of moving mirror fragments she has connected the Israeli and Syrian watchtowers on either side of the border reminding viewers that people on both sides suffer the same oppression, erased memory and fragmentation of identity. Hiba Ansari’s installation, Mathematics Book: To Noura Bazkadi, is inspired by a book belonging to a dead child that she found in the rubble of a house in a bombed Syrian village. Like the original book, Ansari’s book is torn and burnt, but unlike the original it has no mathematical logic and features needles, sticks, and photographs of broken kitchen utensils commenting on the suffering and destruction in her country that defies all logic. The show also features a laser cut dress by Syrian fashion designer Rami Al Ali, which is inspired by the mashrabiya screens in Islamic architecture. “Women have always been a source of inspiration for Rami and his label seeks to empower women through fashion. Like most of the artists in this show, we have a special relationship with him because in the 1990s when he was still at university, he worked for the Atassi gallery in Damascus. It seemed fitting that he present this unique piece as an ode to the women artists of his homeland,” Atassi says. Jyoti Kalsi is an arts-enthusiast based in Dubai. Personal Revolutions will run at Warehouse 60, Alserkal Avenue, Dubai until April 8.